The Tarahumara, an indigenous group of northern Mexico who gained widespread attention from the barefoot running craze (check out our post from February 2011 here), have been experiencing a drought that has lasted for over 15 months. The dry conditions have destroyed crops and brough hunger and food shortages to their communities in and around the unforgiving Copper Canyon region. The Tarahumara number over 120,000, and have maintained their distinct culture through the colonial and capitalist eras, but these new environmental events (drought and unusual cold) have made it so that today, they can not feed themselves. The Mexican government has brought in some food supplies, but it appears that more will be needed. The Tarahumara, known for their incredible endurance and strength are now facing another great challenge, this time brought on by the forces of nature that are outside of their control. 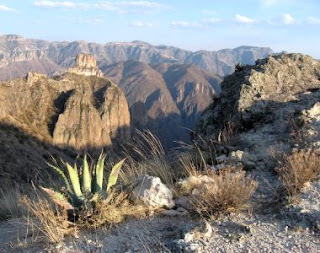 No Tarahumara Village. That is the worst idea for helping out a group of people struggling because of climate changes. Help them ride it out and then let them be. zo & tender - thanks for your comments! This question of development for tourism is a difficult one to figure out. I tend to think the ideas must come from the communities, but the problem is usually in the implementation. Building trust between the resources that can help in these types of endeavors (anthropologists, scientists, governments) and local communities hasn't really been all that successful. I think this due to a lack of understanding about what it is that each side wants from each other, what they want for/from themselves, and what the implications for such projects might be. In the end, there is a ton of work to do in the world, but too few resources to draw from. And development has only created the idea that help must come from the outside world. It's tough all around.